As you recall, the Twins front office was awfully busy around the trade deadline in 2018. It was a tough time for some Twins fans who would miss seeing some of their favorite players dealt to contending teams. 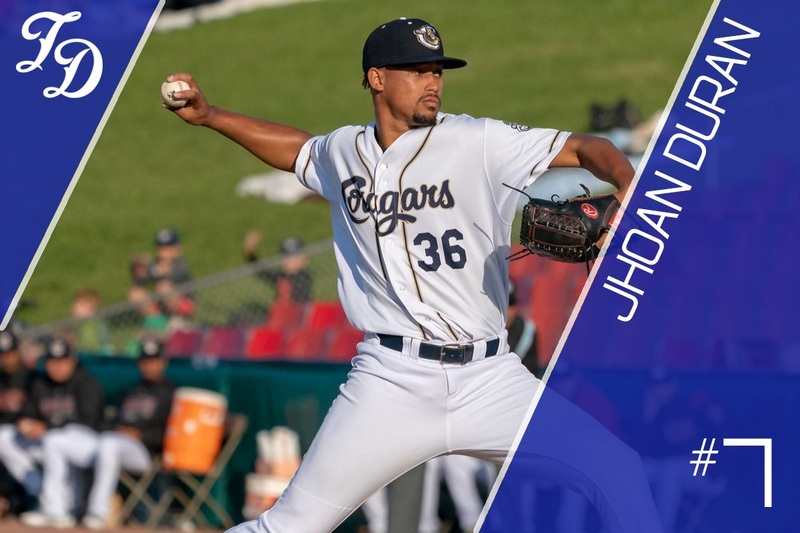 The one positive to come out of that situation was the acquisition of some quality talent including our choice for the Twins #7 prospect, Jhoan Duran. Jhoan Duran came to the Twins along with outfielders Gabriel Maciel and Ernie de la Trinidad in exchange for Eduardo Escobar. When the trade was made, we knew very little about the three. It’s fair to say that Duran has made a strong impression in his short time with the Cedar Rapids Kernels. There is a lot to like. When Jhoan Duran signed with the Diamondbacks in February of 2015 out of the Dominican Republic, he was tall and lanky. That means that he was often touted as “projectable” as he had room to fill out. When the 2018 season ended, Duran stood 6-5 and weighed in at about 220 pounds. With the increased strength, Duran’s fastball has taken off. Duran throws 94-96 and even touched 98 mph. If you watched Tom Froemming’s Prospect Spotlight on Duran, he was hitting 96 in late August despite already being over his previous career high innings. He also gets some sink on his pitches. Duran also throws what appears to be two different breaking balls. He has a slider that can dart out of the zone, but he also has more of a curveball that drops. Both can be swing-and-miss pitches. He also is working to improve his changeup. Potentially, he’s got a big fastball with movement, four pitches and the ability to miss bats. Yes, potentially there is a whole lot to like in Jhoan Duran. For Duran, he needs to work on the things that all young pitchers need to work on. While he has shown good control, he will need to continue to improve his command. While most believe that he can remain a starter, that will likely depend on continuing to improve and be more consistent with his secondary pitches. Especially, his changeup remains a work-in-progress. Development of that third (and maybe fourth) pitch may determine whether he remains a starter or if he becomes a potentially dominant, triple-digit throwing late-inning reliever. Before his six-inning stint to end the 2018 season in Cedar Rapids, his numbers had not yet matched his stuff. He had an ERA of 4.75 a 1.50 WHIP in 64 2/3 innings with Kane County before the trade. He struck out 9.9 batters per nine innings, but he also walked 3.9 per nine innings. After joining the Kernels, he was incredible, posting a 2.00 ERA and a 0.81 WHIP over 36 innings. He increased his K-rate to 11.0 per nine innings, and reduced his walks per nine innings to 2.5. So was it a great, short-sample size six-game stint, which included seven no-hit innings in his Kernels debut, or has Duran actually turned corner in his career? After spending last season in Cedar Rapids, Duran will start the 2019 season in Fort Myers. At this point, it’s all about developing those things (third and fourth pitches, consistent command). Working in the Florida State League should allow him an opportunity to put up some big numbers and potentially continue to rise up the Twins prospect charts. If he gets off to a strong start, he will certainly be a candidate for a midseason promotion to the Twins new Double-A affiliate in Pensacola. Get to know more about Duran and many more minor league players in the 2019 Minnesota Twins Prospect Handbook. Don’t know that I’d have a guy with Duran’s track record...and this far from the show, ranked ahead of Thorpe (and maybe one or two others). But I’ll say this...the kid looks the part physically. Was never anywhere near 9k/9 his first 3 years of pro ball. But then all of a sudden last year happened. Maybe a bit of a late bloomer as the strength finally catches up with the length? I hope so. I think I need some more success at the upper levels before I'd rank him this high. But hopefully the Twins push him a bit and he continues to improve. 108 games started, 599IP, 2.42ERA, 1.10WHIP, 9.5/3.6 K/BB. Love this ranking!A good season from Duran, could easily vault him into the top 4 with his stuff. He was never ranked this highly on the mlb.com rankings when with the Diamondbacks - #20 in 2017, not in the top 30 in 2016 or 2018; their 2019 team rankings don't come out for a couple more weeks. This ranking seems aggressive and a little premature to me. This looks like a guess ranking based on stuff.Have no problem with it, he will either be in the top 10 if he can harness his stuff this year or way down next year if he can't.This is what rankings are about. It is great to see this many pitching prospects with great upside in the system.Since success rate should be between 20 - 50% numbers do matter. I understand your argument, but at some point there has to be a balance between stuff and statistics. I was disappointed to see that Gonsalves tops out at 91, doesn't have pitches that can strike out MLB hitters, and also has poor command. It's not that I've totally given up on him, but he looks to be a 5th starter or a decent reliever if things go right in my eyes. He's done a great job in the minors, but unlike Berrios I don't know if his stuff will let him be more than a AAAA pitcher. Conversely, if Duran can put things together, he has the stuff to be a great starter. I could see him being a #2 starter if everything goes right, though mostly throughout his career, it hasn't gone right. Continue to be more than pleased with what the FO did last July.They totally changed the quality and depth of the entire organization.Have to believe they will use those bullets over the next couple years.Whether that is by continued trading down a few levels and out a few years or by enhancing a trade for a MLB ready asset remains to be seen.The important thing is they stockpiled a lot of assets and this kid just may be the cream of the crop. Problem is that not so long ago Gonsalves was thought of as a for sure #3 and possibly a #2. Now he's no more than a AAAA? We so quickly discard one prospect for another and the result is we continue to "hope" that our time to arrive is 2-3 more years down the line. Gonsalves was highly touted by the org and if he becomes just another forgot about prospect we need to know why. Prospect rankings, however, typically have very little to do with the stats, though they do obviously factor in. But Duran's upside is top of the rotation starter. That's why I rank him higher. That's'why I have Graterol ranked higher. Seth (6), Nick (8), Tom (13), Cody (7). I would have Gonsalves ahead of Duran on prospect lists, though. He could turn into a mainstay in the rotation for years to come. Duran is a long way from becoming that. No one thought he was that good. You're not likely to find a statement from any of the credentialed prospect pundits that describes Gonsalves' ceiling as higher than a #3 and certainly not a sure thing at that. Most have described his ceiling as back end. I doubt anyone in the organization pasted a #2 target on kid's back either. There's a very good chance that Duran, who is being touted by us, not by the organization, will cease being a darling just like we curbed our infatuation for Gonsalves. Let's just remember who does the touting around here. I think he needs to buy an "O". Is there some way, Seth, that you all can factor in the probability of player X reaching his ceiling.Kind of like going to Vegas and throwing the dice, knowing there is a 20% probability of X happening and a 30% probability of Y happening. Not all potential front of the rotation starters are the same.You may think that Graterol, for example, has a 30% chance of reaching his ceiling.Whereas, you may think that Duran has a 10% chance of reaching his ceiling with both having ceilings of an ACE. Has anyone attempted to do something like this? The reason why is because that's baseball. The rule of thumb I use is, if you have 10 top starting pitching prospects, 25-30% will make it. Pitching is a numbers game. I learned that many years ago from Andy MacPhail. It's relevant because 80-90% of starting pitcher's rookie debuts are similar to Gonsalves. Our very own Gibson, May, and Berrios's debuts were not dissimilar. It's part of the process. He was the third best Twin's prospect at the beginning of last year. Top 7 or so in 2016. Somebody must have thought that, or the Twins prospects have been WAY over rated the last few year? Curious what he has changed or gotten better in the Twins organization that he wasn't that highly rated in Arizona but is here? Hoping it is more than he was traded for Escobar or the 7 inning no hitter he threw. He was a BA top 100 prospect in 2017 and 2018... so if he was overrated, it was by all... but I also think that leads to the point that we need to be a bit patient with him. Not every prospect hits the ground running (see Berrios, Jose). There's still time for him to put it together. It's especially interesting to peek at these rankings against Keith Law's recent list; there's a pretty significant divergence all over the place (except for the top 2). Law is calling Duran a one pitch guy and definitely sees him as a reliever. Nope, no expert has ever thought Gonsalves was a front end guy. Maybe a few fans did. When Gonzo was 3rd in TD's rankings, the system was at best a top 10 system. This year, it's a top 5ish system. In retrospect, his #3 ranking was probably generous. He fell for two main reasons: one, because a whole slew of prospects have surged for legitimate reasons, Graterol being a prime case in point, and two, he's probably lost some luster because of his rough start in MLB and the things his debut illuminated to reinforce the expert views that he probably settles in as a back end guy if he fixes his remaining skill deficiencies. I think you'd be reaching for something that's not there to conclude what you're suggesting.